Motion detectors are a big part of a security system, but in order for them to be valuable they have to work the right way. That means they need to be mounted correctly — and that’s about height as well as other factors. A motion detector on or near the baseboard area is only going to pick up things that are very near the floor. It could be triggered by a pet very easily, but a lot of people may just step over it and avoid it. With a higher mounting height the detector will pick up a bigger area, including the detection of people who are in the vicinity — and that’s the goal of the detector in the first place. 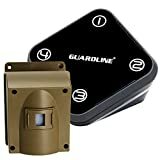 There are differences of opinion on how high a motion detector should be in some cases, as there are different makes and models of these detectors, along with different companies that create, sell, and monitor them. The manufacturer’s advice is usually the best to follow, because the company making the device generally knows what’s best for that device. 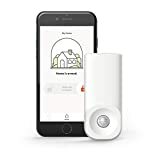 That way a homeowner can get the biggest benefit from their motion detector, and help ensure that they’re getting a quality product that’s mounted in the right place to give them the largest level of value for the money they spend on the device and monthly monitoring. How High Should a Motion Detector Be? 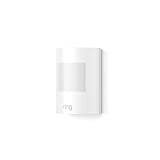 Overall, a motion detector should be mounted on the wall, between six feet and eight feet high. Some people also put their motion detectors on or right near the ceiling. That can work with a standard ceiling height — which is around eight feet — but isn’t as good of a choice for any homeowner who has 10 or 12 foot tall ceilings. These higher options don’t always work well with motion detectors, because a smaller person may not register on them unless they get very close. They could, theoretically, walk past the motion detector on the other side of the room and not be noticed. Naturally, that’s something the homeowner will want to avoid because it lowers the level of protection they receive. Are There Extenuating Circumstances to Consider? With any security system there can be unique circumstances. The goal is simply to make the system work as well as possible, and to keep the homeowner as safe and protected as possible. In some cases there are specific reasons why a motion detector should be mounted at a higher or lower height than would be commonly recommend, but those are usually situations that present as being relatively obvious. Homeowners who have typical homes will want to stick with the normal mounting heights, because it reduces the chances that the motion detector will be able to too easily miss something that’s important. With all of those things working for them, a homeowner will have a good company, strong monitoring, and the safety and security that comes with it. Additionally, they can get a higher level of peace of mind, which can help them feel better overall and sleep better at night. It’s a good way to feel even more protected.